Going fishing with a rod that offers outstanding performance like the Mitchell 300 Combo is something that anglers look forward to. The combo consists of a 24-ton graphite made a rod that utilizes the innovative Bail Halo design credited with superior line management. The rod is ultra-light and stiff. Other than the stiffness, it is a great quality rod that comes in great pricing. It also comes with a reel that will not disappoint you. It is smooth, excellent, and light. 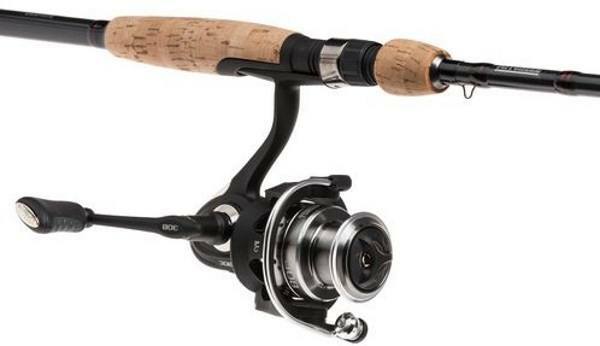 The Mitchel 300 spinning combo is one of the trusted fishing tackles in the market. It features the innovative Bail Halo design and comes with 8 bearings, one of which is anti-reverse. The reel is made of a strong advanced polymeric body and rotor and comes with an aluminum spool and handle, which gives it the strength it is associated with. It also comes with a multi-disk system whose job is to ensure that the reel experiences consistent drag pressure. It also consists of stainless steel guides and inserts through which the line is fed and help in loading the spool. On the other hand, the combo comes with a rod whose blank is made from 24Ton graphite which increases the rod's strength and sensitivity. Lastly, it features a lightweight split grip cork handle that allows the angler to control the rod even when faced with a hard fighting fish. Mitchell 300 Combo consists of a 2 piece 7 feet rod that falls in the medium category. The rod can suitably be matched with a line that weighs 4 -12 lbs and can support a lure of 1/8 -3/8 oz. This makes it best suited for surf casting. It can be used to target minnows, leeches and chicken livers. It is a moderate fast action rod that can be used to fish in dirty waters. The rod is fairly stiff and suitable for fishing in water that is covered with weeds. The length of the rod is a critical feature that cannot be overlooked when an angler sets out to buy a rod. It determines the casting distance, and whether the angler will be able to win the war against the hard fighting fish. Mitchell 300 Combo comes with a 2 piece 7-foot rod that fits in a suitcase and is a great tool for traveling anglers. The rod is sturdy, provides more control, and can be used to fish in tight areas. With this rod, the angler can move the line quicker and provide adequate shock absorber action. Mitchell 300 Combo features a rod made of graphite which is known for its superior properties such as high tensile, low weight, low thermal expansion, and strength. Also, graphite is highly sensitive thus gives the rod the sensitivity that enables the anglers to detect when the fish bites the lure. This is important because it allows the angler to set the hook. The rod is a medium-fast action rod that recovers pretty fast after it has been cast. Also, it loads pretty fast. Unfortunately, graphite is brittle and needs to be handled with care to avoid breaking it. A lightweight rod is suitable for anglers who spend most of their day fishing. It does not tire the arm and is more sensitive. The Mitchell 300 Combo comes with a rod that weighs 27 ounces. It is moderate in weight, a thing that makes the rod ideal if you are planning to use it for a longer period. The rod is suitable for fly fishing and can be used by both experienced and novice anglers. Mitchell fishing gears have been around for some time. They are smooth, strong and quite. Mitchell 300 Combo is perhaps the greatest of all. This is a great product you can rely on if you want to target the bass. It is lightweight and casts farther. The pole is 7' long and feels great in the angler's hands. Also, the combo comes with a reel that boasts of smooth drag and superior retrieval. This is a must buy the combo for serious anglers.